We arrived in Amsterdam at 5.30 am yesterday after a most unpleasant 27 hour economy class ordeal from Melbourne. As our hotel could not offer us a room till after 2 pm we only had another 7 hours to kill before we could shower and change out of our Plane Clothes. So we staggered off to explore the city on swollen feet. We took in the Rijksmuseum and the Jewish Museum all before 11 am and then whiled away an hour drinking Heineken and nodding off at a street cafe. Our hotel Hampshire is on Prinsengracht – the same Gracht that Anne Frank’s Secret Annex was too. What a charming, delightful place Amsterdam is. Like the postcards it is full of hump-backed flower-lined bridges over sleepy canals lined with houseboats. The whole place has the feel of a quiet English village. Why of course? This is Holland and as far as I recall the Dutch were never colonised by us. I am most impressed by their concerted effort to have English as their 2nd language and be so fluent in it. Even the Malaysian taxi driver spoke fluent English as well as Dutch. He couldn’t find our hotel but he spoke 3 languages fluently. Thank god that they all do speak English as their language is so incomprehensible. Looking at the signs on the way in from the airport looks like someone hurled a whole load of pieces off a scrabble board at a sign. So many Op, Zijs, and Slags and words with double vowels in them. Voorzichtigheid. How can that be a word? The whole city is so quiet you can 0ften hear nothing but birdsong. I am told that as it is July school holidays the city has been emptied of Dutch (probably gone to clog up the South of France) There still seem to be plenty of people – just not noise. Bicycles make no noise and the cars can only drive about 10 kms per hour on the narrow cobblestoned streets and there is no car horn honking or any shouting,. It feels like someone put the mute button on a movie and all you hear is silence. We had our bedrom windows open all night in our hotel and it was so silent i could hear my own heartbeat. After sleeping from 2 pm yesterday until 6 am today NON-STOP I feel totally refreshed. We spent the day tootling around on bikes. I felt very vulnerable not wearing a helmet but it was rather liberating too. I love the bike mentality in Amsterdam.. As the roads are so narrow and the canals so tortuous cars really are a stupid thing to use. They have sensible designated bike lanes largely separated from the road like a second footpath so riders don’t have to worry about idiots in parked cars opening their doors into oncoming cyclists as happens in Australia where we largely share the road with arrogant grumpy drivers who hate bikes. The large railway station has multi-level BIKE park for all the commuters who ride into the station to catch the train to work. How civilised is that? The Dutch are so insouciant on their bikes. Every young person appears to be chatting on their iPhone with the earplugs in and I was horrified the first time I saw a young woman whizzing through an intersection, head down texting furiously with both thumbs. You can’t come to Amsterdam and not see Anne Frank’s house. So I had booked and prepaid our entry for 9 am before we left Australia. Which meant we were one of the first tourists in the door. Although it is a rather sanitised version of the original Annex it is still eerie and meaningful to tread the same boards she did all those years ago. To live so long in the dark, without any Vitamin D from the sun seems shocking. They must have been so malnourished. She mentions eating kale that was years old and stank. Her best friend, also a Jewess was “lucky” enough to have been naturalised as a Portuguese citizen before the war and as such could not be as maltreated by the Nazis as they had a treaty with Portugal. This young girl was still deported to Bergen Belsen but given more rations. She could talk to Anne over a brick separating wall so she would throw her rations over when she could. She was the last person to talk to Anne before she died a month before the camps were liberated. The most moving thing for me in the exhibition was a photo of Otto Frank, Anne’s father who was the only one of the entire family to survive. The photos shows him leaning on a pole in Anne’s room at the Secret Annex in 1960 looking sad and alone. When we exited Anne Frank’s house the queue to get in was about 200 people long. Why don’t people think a bit more? Plan ahead a bit more? Get up a bit earlier? Personally I’m glad the average tourist didn’t as it made our experience leisurely and far more enjoyable. I’d hate to be squidged in amongst all that crowd trying to see things the size of a wettex in a glass display. Outside is the Homo Monument. A monument to all the Homosexuals who during the second WW were made to wear pink stars of David and were also deported to the Death Camps. You like to hope that these monuments, diaries and testimonials will prevent it all from happening ever again …….. until you reach the last exhibit in Anne Frank’s museum which explains that each year there are more and more Revisionists who want to discredit the Holocaust and dispute its reality as “a Jewish conspiracy”. You wonder how any notion so ludicrous could get off the ground – before you realise that Man is essentially very racist and exclusionist and that is why there is so much cyber-bullying to name but one form of modern-day discrimination so many of us become victims of. The sad truth is that there will aways be bullies and cruel people out there who like to subjugate and terrorise others. You and I might not be like that but I’m sure we know people who could be in some form…..
We never learn. History is destined to repeat itself no matter how many Anne Frank testimonials there are to remind us. Ahh Yes the joys of cycling sans voitures. 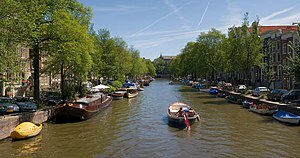 How beautiful it all sounds, tulips, canals, fine art and birdsong. How lucky we all are and how acutely we should appreciate it too. Those cyclists are lethal to unsuspecting pedestrians – you need to keep your wits about you when on foot. Having said that I loved taking photos of all the variations on the normal bike I could find.